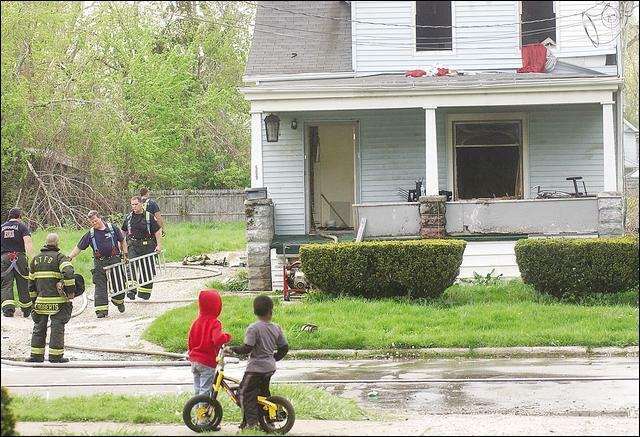 ASHTABULA � A late-afternoon fire Monday at a vacant house on the west-side of the city is suspected to be arson, fire investigators said. Ashtabula Fire Department Capt. Gerald Senger said Tuesday that evidence found at 509 W. 36th St. points toward arson. Heavy smoke poured from all levels of the two-story home when city firefighters arrived on the scene shortly before 5 p.m.
�That was nasty yellow smoke,� Senger said. A neighbor said it was a rental home but it had been empty for about six months. According to the Ashtabula County Auditor�s Web site, David L. Filby of Kingsville owns the house. He owes $8,203 in delinquent taxes, and the home is in the midst of foreclosure, according to county records. Several neighbors stood outside Monday to watch the firefighters battle the blaze. The fire was brought under control at 5:26 p.m., after firefighters sprayed water hoses on the first and second floors of the structure. The fire remains under investigation by the Ashtabula Fire Department and the Ashtabula Police Department.